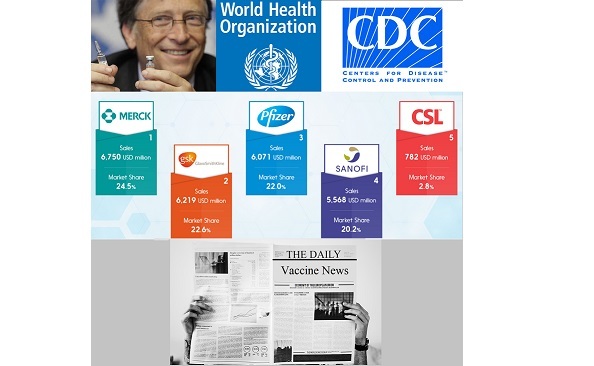 The Vaccine Information War: Government, Big Pharma, Gates Fund Corporate Media Attack on "Vaccine Hesitancy" as "Public Threat"
On Jan. 16, 2019 the World Health Organization (WHO) issued a report ranking “vaccine hesitancy” as one of the top “Ten Threats to Global Health in 2019.” It is clear that mass media communications today is being controlled by corporations financially tied to pharmaceutical companies and influenced by powerful political institutions in society. It goes a long way to explaining why mainstream media outlets have been united in attacking parents and physicians who defend the ethical principle of informed consent, including informed consent to vaccination, and are calling for vaccine exemptions to be severely restricted or eliminated. The five largest companies in the world today are Apple, Google, Microsoft, Amazon and Facebook. These and other technology corporations dominate online communications and sales and are positioned to join together to aggressively market vaccines and promote “no exceptions” vaccine use policies endorsed by the WHO and governments. The threat to autonomy and freedom of thought and speech posed by these companies, especially in censoring online public conversations about vaccination and health, is considerable. Good enough for Bill, good enough for me.